Price: $1000. Check for current sales. The Verb is a lot of bike for the money, even with all the house brand parts. GT has done what few have done before: they’ve broken the $1,000 price barrier with an actual full suspension mountain bike. They had to spec house-brand suspension to do it, but at this price level, a beginning mountain biker can broaden their trail selection because they have suspension on both ends. The GT Verb has 120mm of travel front and rear and uses a suspension design similar to its big brother, the Sensor. The Pine Mountain features plus-size 27.5” tires, also referred to as 27+. It’s a fully rigid bike, meaning no suspension at all. The Pine Mountain has nice, big fat tires that provide all sorts of traction and a smooth ride. The Pine Mountain is one of the only bikes crafted from chromoly steel, an excellent choice of material because steel absorbs bumps and is less stiff than aluminum frames. The rigid steel fork is extra tall so if you upgrade to a suspension fork the handling and seating position will still feel right. The Pine Mountain 1 is part of Marin’s 30th Anniversary Heritage line and this bike is a personal favorite. Standout feature: An amazing price for a Plus hardtail, the Marin Pine Mountain 1 is the most affordable brand name Plus bike on the market. The Scott Scale 970 is a bike that looks fast before it even hits the trail. The Scale 970 is an entry-level 29er hardtail that has a similar look, feel and geometry to its more upscale carbon brothers. It’s designed for speed and efficiency. With lockout function and adjustable rebound, the fork can be configured for every rider’s unique requirements. Standout feature: The internal cable routing adds to the fast, slick look. The components on the Motobecane Fantom are so strong they speak for themselves: RockShox Recon Silver fork w/PopLoc remote, Shimano SLX/XT 3×10 drivetrain, SRAM Guide R hydraulic brakes, VP platform pedals and WTB tubeless ready wheels. Motobecane is a direct-to-consumer brand sold by aptly named online retailer Bikes Direct. They’ve managed to make spec’ing affordable bicycles an art form. This alloy framed 29er offers a plethora of standout features. The Rock Shox Recon is levels above most of the other forks seen in this price range. It offers more substantial legs, more travel, more adjustment and even includes a bar mounted remote for the lockout. The full Shimano drivetrain (minus KMC chain) is also a level above the rest. The SRAM Guide R brakes are way above this weight class as well. Finally, the WTB tubeless compatible rims offer options to grow for the advancing new rider. Standout feature: Most every part spec’ed on the Motobecane Fantom 29 Elite is a standout. Rocky Mountain‘s home in Vancouver, BC is known for it’s steep terrain, slippery roots, and skilled riders. Rocky Mountain believes that the frame and geometry are what makes a bike and how it rides. The Soul has an alloy frame with a refined riding position, allowing for more all around trail usage rather than XC riding. The coil-sprung (rather than air-sprung) fork allows this bike to be used for more aggressive riding and longer durability. Other standouts include a full Shimano drivetrain and disc brakes, as well as Maxxis tires. Standout feature: Suntour Raidon 120mm coil fork with lockout and rebound adjustment offers more travel than many bikes in this price range. The Rockhopper packs a lot of cross country fun into a small price tag. Specialized bikes are known to have a certain ride quality that lends its elite riders to winning. Somehow they’ve managed to carry some of that je ne sais quoi down the line. The Rockhopper Comp has 29in wheels and a mix of Shimano and SRAM on the drivetrain. The Shimano hubs and hydraulic disc brakes are known for durability and easy maintenance. The Specialized Rockhopper is a model with a lot of history behind it. 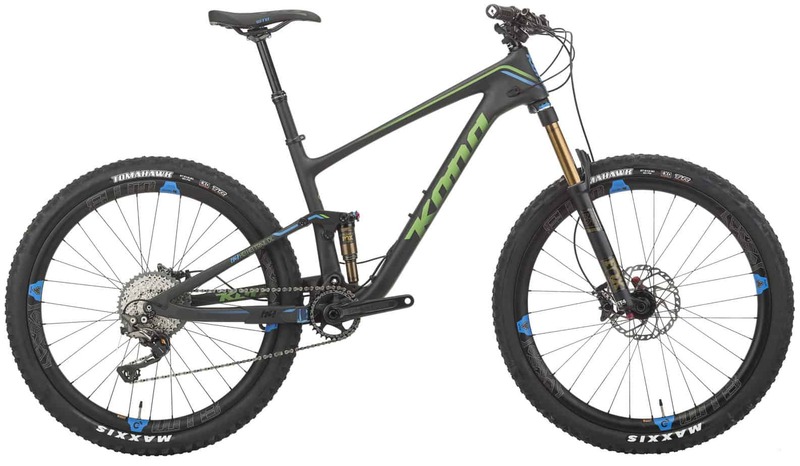 For 2016, the Rockhopper line uses alloy 29er hardtails. Although the bigger hoops and 100mm fork might shout XC, the geometry of the bike is actually more trail oriented. The result is a bike that can handle most beginner’s demands even if that includes the occasional XC race. Standout feature: The A1 SL frame is a step above Specialized’s lower end hardtails. Trek works with the grandfather of mountain biking, Gary Fisher, to create some of the fastest cross country bikes around. Much of their secret lies in the G2 fork offset found on Trek’s 29er bikes. This technology makes the X-Caliber feel comfortable at high speeds, yet still responsive at slow speeds. The X-Caliber has a lightweight alloy frame, RockShox fork, Shimano gearing, and even Shimano hydraulic disc brakes. The X-Caliber 8 provides a race ready platform with an impressive seven sizes available. They also use smart wheel size to spec 27.5″ wheels on the two smallest sizes and 29″ wheels on the other five sizes. Standout feature: Seven sizes provides an option for pretty much everyone.